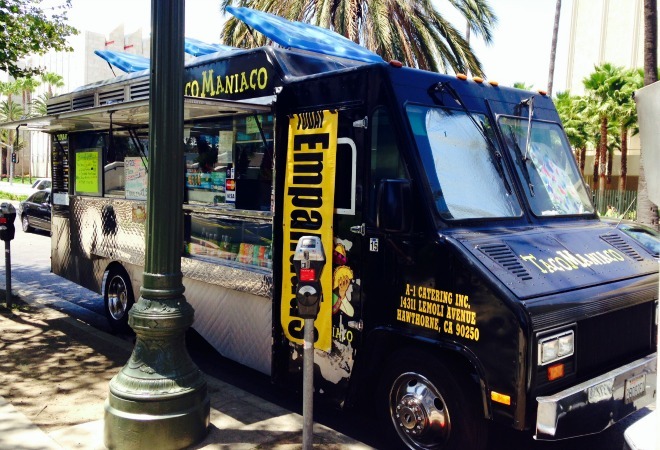 The Truck: All black featuring a caricatured, sombrero-wearing man and the Taco Maniaco logo. The Lowdown: All manner of Mexican comfort foods. The Loot: Cash and cards accepted. The Goods: The truck offers an assortment of Mexican classics like tacos ($2), flautas ($2), burritos ($7), an assortment of quesadillas ($7), and flan for dessert ($3.50). The Verdict: We always like to see a food truck that offers a daily special. This shows that the chefs within have vision and aren’t afraid to try something new. When we noticed that Taco Maniaco was serving empanadas, we jumped at the opportunity. Out of the four empanada flavors available, the server recommended the shredded beef and chicken mole—we got both. We were expecting to receive a delightful smelling crescent shaped meat pocket, but in reality we got a half open sheet of puff pastry stuffed with meat. We’re not sure who the maniac was that decided puff pastry was equivalent of thick, flaky empanada dough, but we are happy to say that the beef was cooked well. As for the mole—well, it’s always a challenge to get right. Previous articleFlashback Friday: Who Says You Can’t Please a Woman?